Coaches preparing for a contest will gather all the information they can on the opponent's strategy and individual strengths and weaknesses. One of the most common devices is scouting the opponent's games and practices. If it's impossible to see every game, the coach can resort to television and game movies. This form of observation can make a valuable contribution to the coach's store of knowledge and game plan. Unfortunately, the inherent flaw in visual observation is the difficulty of (1) quantifying the players' movements with relation to the ball and each other, and (2) obtaining statistical analyses of these movements. This "hidden information" includes the positions of the players on the court, the ball positions, and the game strategy, plus the players' speed of movement with regard to their positions, their role in the strategy, and the speed of the ball at any point in the game. Once this information is gleaned, the coach can proceed with cluster and density analyses of the area covered by each player, the probabilities of the various hits, passes, throws, etc., of the ball, and the reaction time and speed of movement of each player. 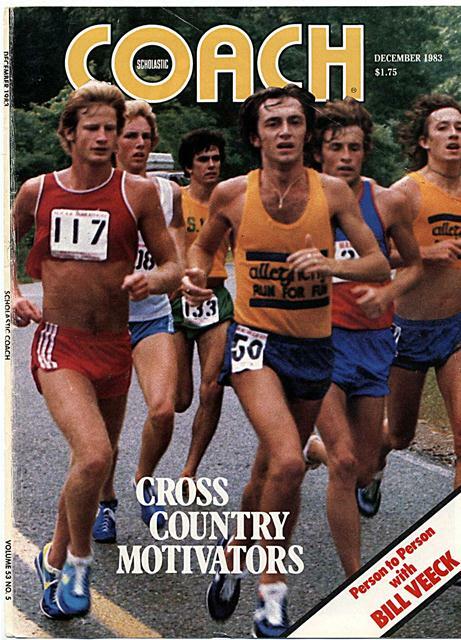 first met Arie in 1978 at the USOC Training Center in Colorado Springs. Arie was coaching the U.S. Olympic Women's Volleyball Team which, at the time, was held in very low international esteem. 1. Understanding the basic nature of the particular game. 2. Recruiting the proper athletes. 3. Implementing specific fitness training to develop the proper energy sources required for the game. 4. Developing the proper skill level. 5. Learning and understanding the opponents' efficiencies and deficiencies. 6. Acquiring and storing data on the teams playing in the major international tournaments. 7. Simulating various game situations to improve the team's skills in these areas. 8. Implementing preventive training programs to avoid injuries and to promote rapid recovery when injuries do occur. 9. Obtaining the necessary technology for these items. Let us look deeper into these factors, using the Women's Volleyball Team as our laboratory. of view and compiling statistical analysis on the formations used in the game-including high-speed cinematography of various national and international games. One of the first problems encountered by Arie was to assess the vertical jumping heights of various players throughout the world. We had to determine biomechanically how they jumped and what kinds of movements they performed in volleyball. 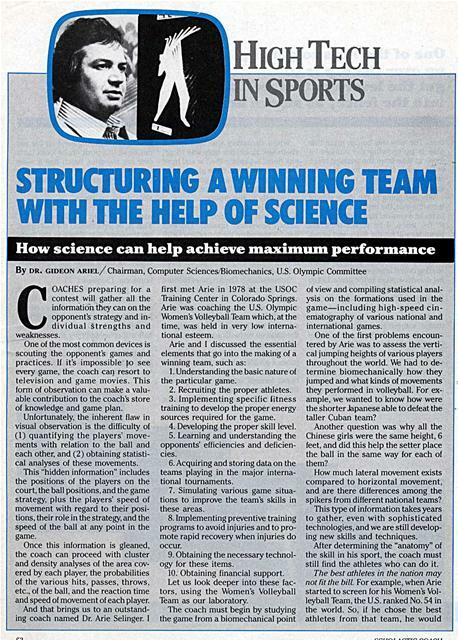 For example, we wanted to know how were the shorter Japanese able to defeat the taller Cuban team? Another question was why all the Chinese girls were the same height, 6 feet, and did this help the setter place the ball in the same way for each of them? How much lateral movement exists compared to horizontal movement, and are there differences among the spikers from different national teams? This type of information takes years to gather. even with sophisticated technologies, and we are still developing new skills and techniques. After determining the "anatomy" of the skill in his sport, the coach must still find the athletes who can do it. have guaranteed himself another No. 54 team. Since his goal was No. 1, he had to go looking for the proper talent. He had to be coach, salesman, and psychologist. Some of the athletes had never played softball, but possessed the inherent qualities of greatness. For example, Flo Hyman, who was 6'5" but had never played volleyball, was an early choice. Arie explained that with his methods of training, she could become the world's greatest volleyball player. Today, after eight years of work, Flo Hyman is the best player in the world. It took years to fill all the positions, but each selection was done scientifically, based on information provided through high technology. There were no "shots in the dark". methods were required to implement the training. Merely playing the game or guessing what you were going to do next was insufficient. done close to sea level and on special modalities to develop the physiological factors essential to success. The team would have to live together, practice full-time, have their own gym, have access to the best technology, and have good weather and community support. Arie investigated various sites and chose Coto De Caza, Cal., home of the Coto Research Center-and-site of the Modern Pentathlon for the 1984 Olympic Games. 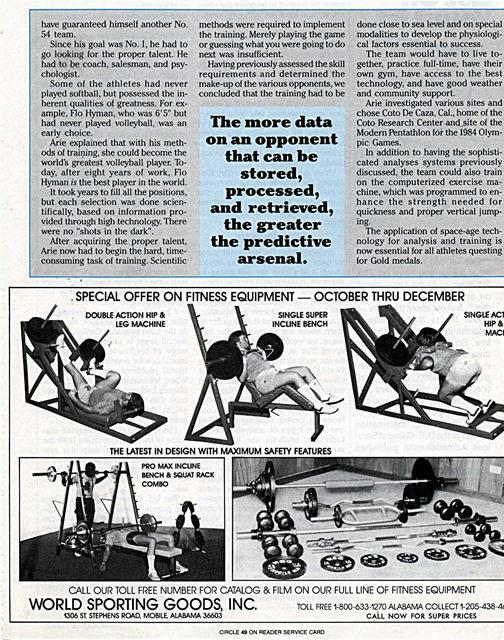 In addition to having the sophisticated analyses systems previously discussed, the team could also train on the computerized exercise machine, which was programmed to enhance the strength needed for quickness and proper vertical jumping. The application of space-age technology for analysis and training is now essential for all athletes questing for Gold medals. Our list is the Consumer Information Catalog- And it's free. So are many of the more than 200 government booklets in the Catalog. Booklets on employment, health, safety, nutrition, housing, government programs, and lots of ways you can save money. The Consumer Information Center of the U.S. General Services Administration publishes the Catalog quarterly to bring you the most up-to-date word. So to shorten your list, send for the free Consumer Information Catalog. It's the thing to do. To achieve maximum skill levels, Arie requested biomechanical analyses for the vertical jump portion of the spike. He wanted to improve the players'vertical jump but without generating so much forward movement that the athlete would touch the net. By simulating different positions on the computer, Arie developed a technique that allowed the players to gain vertical height at an angle which enabled them to land at a significant distance from the net. In spiking, it was found that excessive arm movement was unnecessary and that it tipped off the direction of the spike. By eliminating this excess movement, Arie significantly increased the velocity of the spike and masked its direction. Other skills were developed by simulating the activity on the computer screen and then adapting it to the team. Result: Most teams throughout the world began imitating the U.S. team! Understanding the opponent is not an easy task. Obviously, the Soviet Union and China are not going to share information with anyone elsethe way the U.S. does. Try asking East Germany about training methods, you will be lucky to receive a response. Arie and I decided that in order to learn about the Chinese or the Japanese, we would have to collect highspeed film at the national tournaments, such as the World Cup-and the World Championship. The Russians or Chinese cannot hide their "secrets" in these games. They have to play their best, and all of this is captured on film. This film is analyzed at the Coto Research Center, utilizing individual and team types of analysis. For the individual analysis, the heights of various jumps, the horizontal and lateral velocities of the players, the speed of the ball after the spike, and other important skills are calculated. The formation analysis provides the coach with such vital information as where the ball is likely to land after a certain player spikes it. This "cluster" analysis allows the coach to determine the probabilities of success of a particular formation. Knowing these factors is like playing poker while seeing your opponent's cards. understand not only the biomechanical factors but the philosophical and historical bases for the opponents' reactions in various situations. For example, what makes a team "crack" or react abnormally in critical situations? Let's assume that Arie would like to play a mock game against the Chinese before actually meeting them in a major competition. 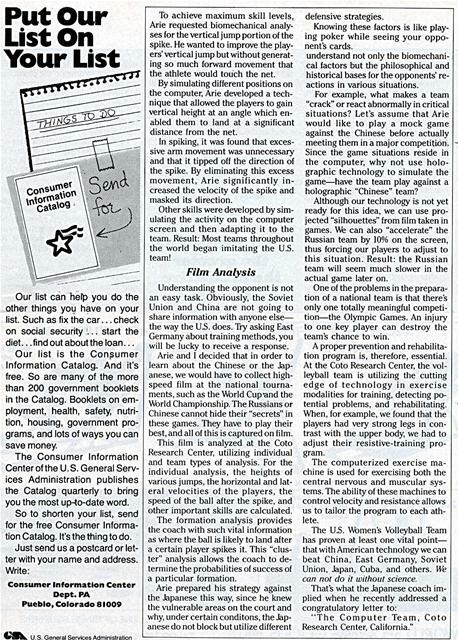 Since the game situations reside in the computer, why not use holographic technology to simulate the game-have the team play against a holographic "Chinese" team? Although our technology is not yet ready for this idea, we can use projected "silhouettes" from film taken in games. We can also "accelerate" the Russian team by 10% on the screen, thus forcing our players to adjust to this situation. Result: the Russian team will seem much slower in the actual game later on. One of the problems in the preparation of a national team is that there's only one totally meaningful competition-the Olympic Games. An injury to one key player can destroy the team's chance to win. A proper prevention and rehabilitation program is, therefore, essential. At the Coto Research Center, the volleyball team is utilizing the cutting edge of technology in exercise modalities for training, detecting potential problems, and rehabilitating. When, for example, we found that the players had very strong legs in contrast with the upper body, we had to adjust their resistive-training program. The computerized exercise machine is used for exercising both the central nervous and muscular systems. The ability of these machines to control velocity and resistance allows us to tailor the program to each athlete. The U.S. Women's Volleyball Team has proven at least one vital pointthat with American technology we can beat China, East Germany, Soviet Union, Japan, Cuba, and others. We can not do it without science. "The Computer Team, Coto Research Center, California." Generated on 4/20/2019 11:15:51 AM (PST) ADI/HQ/GBA/2019/ARIELCLOUD/v3.0.2018.0126.